When thinking of Yoga how it is practiced in western countries, we mostly mean Hatha Yoga: A physical practice consisting of Asanas (poses) and controlled breathing. Traditionally though Hatha Yoga was a practice to prepare the body for the enlightenment of the mind. In our Hatha Yoga classes we put an emphasis on regaining that spiritual aspect. This way you can not only bring your physical practice to the next level, but also your non-physical. 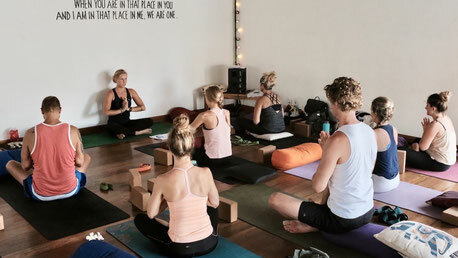 Hatha Yoga classes are normally 90 min long, include meditation or breathing techniques at the beginning and are open to all levels of students. Vinyasa Yoga is characteristically a faster paced practice of Asanas (poses) that are woven together to a flow of movement with coherent breathing. We encourage our students to experience Vinyasa Yoga out of a dancer's perspective, making the practice graceful and fluent. Our Vinyasa flows often come with workout elements to strengthen your balance and stamina, the perfect compensation for our modern lives that are far too often seated and inactive. Vinyasa Yoga classes are 60 to 90 min long and open to all levels, though they might not be a beginner's first choice as there is less assistance. With its long held and grounding shapes Yin Yoga is the perfect way to unwind. Yin Yoga targets fascia, ligaments and meridians and imposes healthy stress on joints and connective tissue. 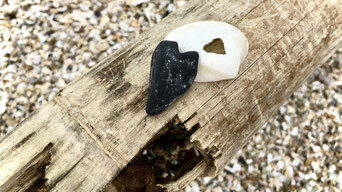 Hereby it supports the release of physical and non-physical blockades, leading to more flexibility and relaxation. Yin Yoga classes are 60 to 90 min long and are open to all levels of students. They require little to none physical strength and are especially well suited for people recovering from injuries. As the name says the purpose of Restorative Yoga lies in the restoration of a healthy and stress-free body and mind. Shapes are held between 5 and 30 min, giving the body the opportunity to completely relax and calm down. Our days are often filled with activities that stimulate the sympathetic nervous system ("fight and flight"). Restorative Yoga gives you the chance to let the parasympathetic nervous system ("rest and digest") take over and renew your energy. 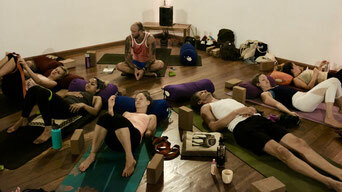 Restorative Yoga classes are 30 to 60 min long and open to all classes. Just as Yin Yoga, Restorative Yoga is especially suited for people recovering from injuries. A Yin Yan Yoga class, also called "Vin Yin Yoga" (from Vinyasa and Yin), combines the powerful flow of a Vinyasa Yoga class with the relaxing recovery phase of a Yin Yoga class. It is the perfect composition for anyone who strives for the balance of strength and flexibility, of challenge and surrender. Yin Yan Yoga classes are mostly 90 min long and are open to all levels. The calming part can either consist of Yin Yoga or of Restorative Yoga. Aside our traditional Yoga classes we offer classes that are aimed at gaining strength and balance, mostly in combination with achieving a certain advanced Asana (pose), a so-called peak pose. The practice strengthens specific muscle groups while lengthening others in preparation of a certain goal. If you have a pose in mind that you always wanted to master, this might be the class for you. Yoga classes for strength and balance are mostly 60 to 90 min long, open to all levels and - as all our other classes - can be booked as a private lesson to specifically target your personal goal.